Budapest is one of my favorite cities — the Turkish baths, the food, the ruin pubs , grandiose architecture, excellent wine, and chrarmingly impossible to pronounce street signs (Hungarian is a really strange language). 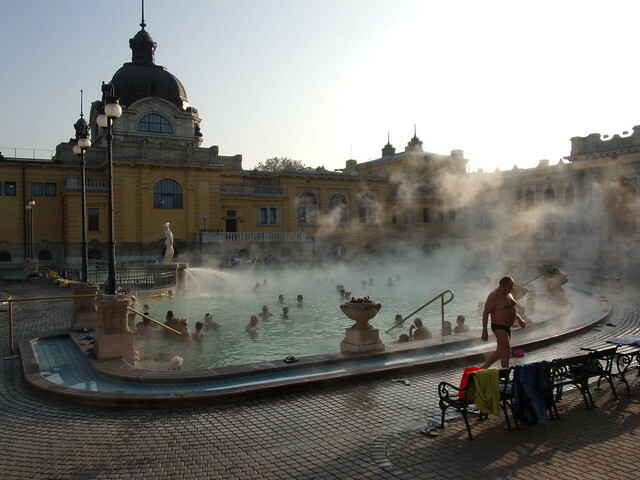 During the holiday season it turns into a winter wonderland — it’s surreal to take a dip in the steaming outdoor pool of Szechenyi Bath while the temperature is below freezing — and a stroll along the Danube is as romantic as it gets. You can find cheap flights to Budapest starting in the mid $400s for most of the winter season. If you want to head elsewhere in this part of Europe, train connections to Prague and Vienna leave daily (and sometimes nightly). You’ll love it here. Jan 23-30 on Swiss Air for $578. Get the cheapest price and support this website by booking your flight on DoHop. Jan 30-Feb 7 on Finnair and British Airways for $533. Get the cheapest price and support this website by booking your flight on DoHop. Jan 28-Feb 3 on Aer Lingus and British Airways (with an overnight stopover in Dublin on the inbound) for $446. Get the cheapest price and support this website by booking your flight on DoHop. Jan 28-Feb 3 on Finnair and British Airways for $591. Get the cheapest price and support this website by booking your flight on DoHop. Jan 28-Feb 3 on KLM for $684. Get the cheapest price and support this website by booking your flight on DoHop. Flights to the Faroe Islands from $500, Roundtrip.